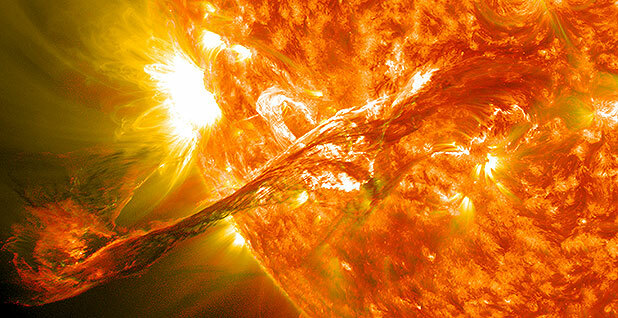 Solar flares have the potential to knock out electric grids. An executive order this year directed a cluster of federal agencies and groups to coordinate efforts at detecting, analyzing and responding to solar storms that could strike the United States. Photo by NASA Goddard Space Flight Center, courtesy of Flickr. QUEBEC CITY — One day, the sun might send a massive explosion of highly charged particles flying directly at North America. If a storm hits, some U.S. cities could be blacked out until the solar storm passes to protect electric grid transformers threatened by storm currents, grid officials explain. Those blackouts, coming with less than an hour's warning, could be how Americans first learn about the threat to the power grid from sun-spawned electrical currents called geomagnetic disturbances (GMD). "This GMD risk, for all intents and purposes, will always be there," said Bob Rutledge, who leads the National Oceanic and Atmospheric Administration's Space Weather Prediction Center, during last week's grid security conference here. The issue took a surprising turn this month with the announcement of an executive order from President Obama on space weather. The order directs a cluster of federal agencies and departments to coordinate efforts at detecting, analyzing and responding to solar storms that could strike the United States. But the order bypassed the North American Electric Reliability Corp. (NERC), the interstate grid security monitor, which has been developing solar storm protections for the grid since 2012. "It was a surprise to us," said Gerry Cauley, NERC president and CEO. The order mentions the Federal Energy Regulatory Commission just once, saying that the agency chair should be "consulted" about future federal space weather actions. A spokesperson for FERC declined to say whether the commission was consulted before the White House acted. The president's order, which White House officials would not discuss in detail with E&E News, looks like an attempt to speed up the 4-year-old FERC/NERC regulatory process, according to some grid officials and experts, who did not want to speak on the record. The most recent FERC GMD order, last month, gives transformer owners five more years before all GMD defense devices are required to be in place, allowing time for more research on how very large solar-generated currents would propagate on Earth, whether they would heat up various transformer models to the point of destructive damage and how best to block the damaging currents. Obama's order says, in effect, to get the regulatory process moving. It directs the secretary of the Department of Energy, in consultation with the head of the Department of Homeland Security, to create a pilot program to deploy, test and evaluate devices that can shield transformers against dangerous ground currents. The United States has limited capacity to replace the transformers that move power across the grid. The order reflects the administration's sense of urgency on the issue, a White House spokesman said. The order states, "Extreme space weather events — those that could significantly degrade critical infrastructure — could disable large portions of the electrical power grid, resulting in cascading failures that would affect key services such as water supply, healthcare, and transportation." Further, the order states, "Successfully preparing for space weather events is an all-of-nation endeavor that requires partnerships across governments, emergency managers, academia, the media, the insurance industry, non-profits, and the private sector." The plan for the pilot project is to be completed within 120 days, a deadline that falls after the inauguration of the new president, who could adopt, amend or rescind the space weather order. An administration-led space weather task force has been focused on the threat for the past year, following release of the last year's National Space Weather Action Plan. That group is driving the response strategy, one member pointed out. "There may be some things that have already been put in place in previous years that we'll have to take a look at and see which approach works best," said Steven Clarke, the director for heliophysics at NASA, heading research on solar impacts to Earth and the solar system. NASA satellites that detect high-energy emissions from the sun are the early warning network for GMD. "We can work through some of those particular items, if there are overlaps with existing regulations, and see how best to proceed," Clarke said. "Would it be better to allow the regulation to be enforced and have any additional plans feed into those regulations, or maybe take a fresh look at the regulations to see if they need to be updated based on what the team with DOE and the other agencies that are involved now may find?" NERC's chief Cauley said the development of GMD standards needs to be based on a thorough understanding of the complex effects of solar disturbances on the Earth and the dangers to transformers. FERC tackled the GMD threat with a two-stage process, initiated in 2012. First, grid companies were required to create operating plans to prevent cascading failures if a solar storm hit. On Sept. 22, FERC approved the second stage with a standard-setting deadline for grid operators to assess solar storm risks to their specific networks and create defenses for transformers and other vital equipment. The regulatory process seeks scientific and engineering consensus, which either protects against serious unintended consequences or invites delay of expensive requirements on industry, depending on how the issue is perceived, experts have noted. The defenses could include the blocking devices called for by the new executive order. Under the FERC rule, utilities have a year for planning and up to four more years to complete any necessary hardware protections. That's far too slow, given the potential consequences of transformer failure, said Thomas Popik, chairman of the Foundation for Resilient Societies, an advocacy group. Cauley said last week, "The important thing is that a lot of work that was referenced in the executive order is already ongoing through the FERC and NERC standards development. We are installing monitoring devices on the grid, to do testing of equipment. "It's very simplistic to think it's only a blocking device," Cauley said, when there are other operating strategies that need to be considered. "FERC's order appropriately tells us over the coming five years to do significant additional research from the [space weather] data we collect to determine the right criteria" for threat assessment and response, he said. "I think we're already on the right track, and we should give NERC and FERC and the industry a chance to implement these standards and the technologies to further develop the science around solar magnetic disturbances," Cauley said. "We're working hard on it. "There are things you can do now — operational things — which utilities have done. Meantime, let's do some analysis to really understand what the impact would be and what the mitigation options are. And then, the big dollars on mitigation, spend that after you know a little bit more about characterizing the threat [and] mitigation. I think that makes sense," he said. Whether the new order accelerates that timetable will depend on whether utilities voluntarily sign up to test blocking hardware. There is only one blocking device now installed on the high-voltage grid, the Solid Ground device offered by Emprimus, a small Minnesota technology company, and ABB, the global grid equipment manufacturer, according to grid experts interviewed at the Quebec conference. Emprimus says its device also protects against electromagnetic attacks from a high-altitude nuclear explosion or radio frequency weapons aimed at transformers by terrorists. "Eight, 10 years ago, didn't know a whole lot about GMD," said Richard Lordan, senior technical executive at the Electric Power Research Institute and a speaker at the Quebec conference. "We have come a long way in the industry," he said, but there are still important gaps in understanding the science and engineering of GMD threats and defenses. Grid operators' first principle is "do no harm," and that makes them wary about moving too quickly with new equipment, he said. In the meantime, solar storm defense includes the possibility of deliberate protective blackouts, Clarke noted, adding that more needs to be done to alert the public to this possibility. "Across the government, agencies have been talking about how we do that for space weather events," mirroring alerts to the public about hurricanes and tornadoes," Clarke said. "We need to increase that public awareness so that people understand that a severe [solar] storm is coming," he added, "that there are certain steps we need to take including planned blackouts to save transformers and the grid, and people will be without power for some time until the storm subsides."